To make sure you get the right motor to power your gate/s its essential to know specific information about the gates and the envirnoment they're in. Motors are designed to operate certain gate formats incorparating factors such as weight, size, opening angle, power output and daily use. To help you choose the right motor to automate your gate/s please read through the information below. If you are unsure about any of the following information simply fill out our site assessment form and get in touch. Our customer care team are on hand to assist with any questions you have about your installation. 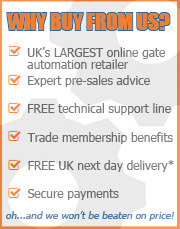 Contact us by email: sales@gatemotors.co.uk or give us a call 01202 717 191. The lines are open Monday to Friday 8:30 - 17:30 (leave a voice message outside these times). Closed weekends & public holidays. What kind of motor is right for your automation requirements? The type of automation you require largely depends on your gate configuration and level of use. Manufacturers design motors to power automations for of all kinds of gate formats. The following information highlights the differnt types of motors available and their intended use. Here you will find which motor type will suit your requirements. If you have/plan to use swing gates then you can choose between 4 types of swing gate motors to power your automation.They can generally be used in either double or single gate configurations. 1. Rams - Gates with hinges fixed to the back of a pillar/post are most suited to mounted gate arm mechanisms (also known as rams). They can be fitted to almost any kind of gate and are relatively easy to install. The motor arm needs to be attached at a parallel angle to the gate and on the inside of the pillar/post. This type of automation is the most commonly used for retrofitting with existing gates. They use a worm drive or screw-jack action to retract the arm in a linear motion, which shortens the arm length, thus opening the gates. Standard Ram - The most widely used and cost effective. Usually only inward opening. Linear Ram - More compact than the standard ram creating a slimmer look. A more discreet motor. Usually only inward opening. Tow Eye Ram - Tow-eyed gate motors are designed so that there is no exposed ram when the gate is actuated. They therefore offer slight improvements in motor lifetime as they offer better weather protection. Tow-eye gate motors also have improved aesthetics, offering a less-mechanical and a more discreet appearance when opening and closing the gate. Usually only inward opening. 2. Wheeled motors - Wheeled motors are easy to install by latching to the opening end of the gate. These are most widely used where there are hinge restrictions for other types of motors. Wheeled motors are recommended where either gate-post/pillars are too small to mount rams or where the space behind the gate is limited (e.g. the gate is flush to a driveway wall when open). However, the driveway surface needs to be flat for the wheel to get decent traction – so broken ground or gravel/shingle are unsuitable for this type of automation. Usually only inward opening. 3. Articulated motor arms - This type of motor is required if your gate hinges are fixed to the front or centre of the pillar/post. They have a bi-folding, hinged arm making them more flexible to fit. Using a hinged arm, articulated motors are ideal for smaller, ornamental gates, pedestrian gates, gates with large post/pillars that would obstruct a linear motor, and gates that need to open outwards. 4. Underground motors - These motors are housed beneath the hinge end of the gate. The motor sits inside a galvanised foundation box which is concreted into place with a soakaway to prevent the motor from flooding. The gate then pivots on a pin which protrudes from the foundation box. Although underground mechanisms are subtle and most aesthetically pleasing, retro fitting to existing manual gates can be very difficult. It is more common to have new gates installed to accommodate an underground motor. Generally underground motors will be inward opening. A sliding gate motor will operate gates which move from side to side across the gate entrance. Sliding gate motors use a cog that is coupled with a toothed rack affixed to the gate. The cog turns engaging the teeth on the rack moving the gate in the desired direction. Sliding gates require either guide track and brackets/roller guides or a cantilever mechanism to ensure they move in a predicted manner. Smaller operating area - The sliding gate needs space to the side of the gate entrance to move the equivalent of twice the width of the gate opening. As the gate does not swing you this will give you more free space on the property's driveway/parking area. Hardware - You will need guide track and wheels, support rollers/brackets and gate stops or a cantilever systems to support the gate to ensure it runs true. Drive mechanism - You will need to decide whether you wish to use a cog and rack drive or chain drive. Cog and rack motors are quieter but require a truer gate travel, whereas chain drives are noisier but more forgiving if the gate has a bit of a wobble! Security - Sliding gates are more difficult to ram or force open, so where anti-vehicle protection is required a sliding gate is recommended. How often will the gates be used per day? The amount of times your gate is used per day is a determining factor when deciding on the right motor for your usage. Motors are designed to operate within a certain capacity (operations per day) so choosing a motor compatible with your desired use is essential for its durability. The level of use will also determine the type of power output for your installation. There are two types of power outputs to consider - 24v & 230v. If you need a high number of operations (opened/closed more than 5-6 times in an hour) then you may wish to consider a 24v system. Required information for choosing the right kit for your installation? 1 - Weight of gate - All electric gate motors operate up to a maximum weight. This is so the gate will operate in a reliable and safe manner. It is essential to know the weight of each gate leaf in order to choose the correct motor for you installation. If you do not know the weight of your gate/s, send us a photo along with the gate/s dimensions and we can advise. 2 - Width of gate - As with weight, gate motors are designed for gates within certain dimensions. The most important dimension is the width of the gate. To ensure you select the right motor to operate your gate you must know the width of each gate that requires automation. 3 - Maximum opening angle of the gate - Each motor has a maximum angle to which it can operate to. Therefore it is important to note how far the gate needs to open in order for a vehicle to enter/exit safely. 4 - Motor Voltage - There are two types of power outputs to consider - 24v & 230v. If you need a higher number of operations (opened/closed more than 5-6 times in an hour) during peak periods such as the morning and evening, then you may wish to consider a 24v system. 5 - Maximum Opening Angle - Each motor has a maximum angle to which it can operate to. Therefore it is important to note how far the gate needs to open in order for a vehicle to enter/exit safely. 6 - Daily Usage - The amount of times your gate is used per day is a determining factor when deciding on the right motor for your usage. Motors are designed to operate within a certain capacity (operations per day) so choosing a motor compatible with your desired use is essential for its durability. What to consider if automating existing gates? Gate moves freely (no friction), opening and closing smoothly and noiselessly. Gate is well balanced - Once stopped in any position it does not show a tendency to start moving again. Linear hinge motion - The gate must move in a linear motion. If your gate/s have a rising hinge it is unlikely you can automate the gate. Rising hinges create vertical travel of the gate bracket (which currently no motor is designed to cope with) which will almost certainly break the motor or shear off the bracket/damaging the gate. What is your gate made from? Another important consideration is what your gate is made of and its type of construction. Is the gate an open design or a filled in solid design (a solid gate acts as a sail in the wind and therefore needs a more powerful motor)? Completely filled in gates may present an artificially high weight to the motor due to wind loading, and this needs to be accounted for. Do they need to open quickly? If you require your gates to open and close swiftly then you should take note of the gate motor ‘duty cycle’ specification. Each operator has a different cycle speed, a higher duty cycle will move the gate faster. The duty cycle speed can be found within the product datasheet (downloadable from each product page on this website). If you want further advice get in touch and a member of our customer care team. Our customer care team are on hand to assist with any questions you have about your installation. 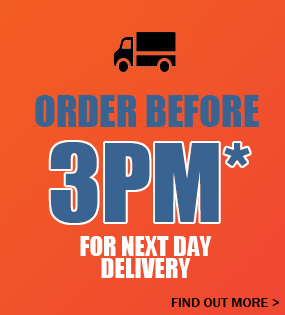 Contact us by email: sales@gatemotors.co.uk or give us a call 01202 717 191. The sales lines are open Monday to Friday 8:30 - 17:30 (leave a voice message outside these times). Closed weekends & public holidays. What you should consider to make your gate automation safe? Protecting both pedestrians and vehicles from moving gates is a paramount consideration and there are a range of safety features and products that you can deploy to provide the safest environment possible for your automated gates. We would encourage a user/owner to ask a specialist (a registered Gate Safe or DHF installer) to check or provide a risk assessment of the gate motor installation. If you have a third party installer/maintenance company they should be aware that the safety of powered gates is required by law. Click here [http://www.hse.gov.uk/work-equipment-machinery/powered-gates/safety.htm] for more information on ensuring the safety of powered gates. The kits we provide at GateMotors include safety features but it is commonplace for installations to require further safety measures. Please take time to read through the information below and consider if/what additional safety features you require for your automation. Safety edges are rubberised bumpers that contain a safety contact sensor that activates the emergency stop function as soon as the sensor detects any contact. The rubber extrusion body means that if your gate does touch something it compresses like a car bumper absorbing energy transfer to prevent damaging the object. You will require a safety edge along the inside bottom of the gate (particularly if there are uneven gaps during operating cycles) and between the gate & wall. If the distance between the wall, post, kerb etc. and the gate when fully open is less than 500mm then an object could easily become trapped or crushed in this space. Safety edges are needed to prevent any possibility of this happening. As with swing gates, sliding gates require safety edges affixed to specific areas of the gate. To prevent the gate trapping an object both gate ends require safety edges. This will make the gate motor cease on contact with an object and reverse its motion. Sliding gates can pose additional dangers for entrapment alongside railings where a hand could fit and also how far the gate is positioned away from a wall/fence which could potentially trap an object. If you believe there is potential for entrapment or concerned about the safety of your automation contact a member of our customer care team. They are on hand to assist with any questions you have. Photocells are required for swing and sliding gate automations on either side of the entrance. These are usually mounted on the exterior-edge of the gate posts, facing inwards towards each other across the gateway. An invisible infrared beam is projected from the transmitter photocell towards the receiver photocell. If this beam is broken a signal is sent to the gates control board to say that an object is in the gateway and the gate/s will immediately stop. Multiple sets of photocells can be used for added protection. If you have large/deep swing gates then an additional pair of photocells should be mounted on posts just beyond the leading edges of the open gate this will cover the full radial sweep of the gate. When the stop button is activated it will stop the gate entirely. This enables anyone to stop the gates motion in an emergency. The button is an exterior device but some models can be programmed to be operated by a key fob to fulfil the same emergency stop function. These are flashing lights usually mounted on top of the wall by an automated gate to warn people that the gate is opening or closing. They are low cost and effective ways to help make people aware of potential hazards. Laser sensor technology can be used to scan and sense objects in the path of the gate (up to 10m detection range) and provide an emergency stop function should an object be detected. They present a high-level of safety with complete three-dimensional detection in the path of the gate. They incorporate ‘time of flight’ anticipation sending the stop signal immediately as an object approaches – necessary with larger gates where momentum will keep moving the gate before it can stop. You are legally required to ensure the correct safety measures are in place for your gate automation. Gates can be heavy and produce strong forces. The guidelines above provide information only. Each gate motor installation is different and will require specific safety requirements. Click here for more information on the legal requirements for powered gates. If you have questions or require further advice on powered gate safety get in touch and a member of our customer care team can help. Our customer care team are on hand to assist with any questions you have about your installation. 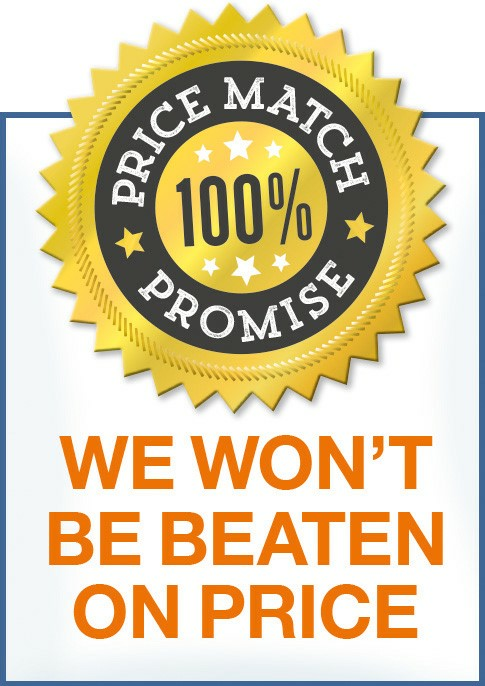 Contact us by email: sales@gatemotors.co.uk or give us a call 01202 717 191. The lines are open Monday to Friday 8:30 - 17:30 (leave a voice message outside these times). Closed weekends & public holidays. There are a variety of intercom systems that allow visitors to call the property from the gate-way using either audio or video feeds. Each intercom system has its own benefits and will suit certain situations/requirements. The information below details the attributes of each system to decide which intercom is right for you. Video intercoms allow you to see who is at the gate using a camera at the call point and having a monitor on the handset receiver unit. This provides a full visual of who is requesting entrance to the property. They come in mono (black and white) and colour variants. Click here to see our rnage of Video Intercoms. These intercom systems work in a similar fashion to a video intercom, but rather than using a wired connection they use 3G/4G mobile wireless to call the property’s handset/s. If the property's handset is not answered the call is cascaded to your mobile phone so you can answer and unlock the gate remotely from wherever you are. You will incur ongoing data cost of video calls when the gate calls your mobile. Click here to see our range of GSM Intercoms. Wired intercoms allow visitors to call a handset in the property to request entry. Wired intercom systems require a little more effort during installation (ground work for cable) but have the advantage of assured signal/reliability and simple function. They are available in 1-way (the visitors voice is heard) and 2-way (visitor and property owner can both talk to each other) and can have multiple handsets receivers for inside the property. They can also be fitted with keypads to allow regular visitors and staff entry via a code. Click here to see our range of Wired Audio Intercoms. A wireless audio intercom will function the same as a wired version but uses a radio signal instead of a wired connection. Wireless audio intercoms send a signal and receive data between the call point at the gate-way and the handset receiver in the property. Wireless intercoms are easier to install as no ground work is required; However, there are some limitations – namely limited range (100m is near to upper limit for most systems with a clear line of sight) and the potential for electro-magnetic interference from nearby energy sources (power lines, mobile phone masts, electricity sub stations, TV and radio transmitters, Radar). Click here to see our range of Wireless Audio Intercoms. Multiway intercoms are designed for apartment buildings, gated communities and office blocks where multiple-occupancy occurs and many different ‘addresses’ are required on the call point. They tend to be modular allowing you add blocks of call buttons for however many properties are needed. Modular systems also allow you to add additional functionality such as video intercoms and keypad units. There are many ways to open automated gates and control access to the property. The following information outlines some of the different types of access control and their benefits/limitations to help you choose the best solution for your installation. Simple push button operation via small key fob device which is easily carried - can be attached to a key ring. Key fobs are standard with all gate automation systems and have a range of 30m (approx.). However, this can be extended, up to 100m (approx.) thorugh additional ariels. Key fobs are radio transmitters which send a coded signal to a receiver to open/close the gate. They usually operate on 433,92 MHz or 868,35 MHz and range in capabilities from a single button (1-channel remote) up to nine buttons (9-channel remote), with 2-channel and 3-channel remotes being the most common. Each channel can operate one automated object – e.g. a set of automated gates, a garage door, a second set of garage doors etc. Most gate automation kits will come with one or two remotes, so consult the kit contents – generally single motor kits have one remote, double motor kits have two remotes. Click here to see our range of Key Fobs. As suggests access control via a key operated switch. Releatively easy to install and are generally mounted next to the gate. Direct control of the gate/s. This type of access control requires manual operation and cannot be controlled remotely. Click here to see our range of Keyswitches. Ideal for communal gate access where numerous key fobs would prove too costly and a digipad would pose too great a security risk (compromised code). These access control systems incorporate a mobile phone SIM card, GSM receiver and a telephone address book. Using Caller-ID (so it never connects a call) it can recognise up to 200 registered mobile phone numbers. Users simply call the gate and the GSM unit recognises the number and the gate opens without connecting the call. Administrators can remotely update the telephone address book adding/removing mobile numbers providing a highly flexible solution. Click here to see our range of GSM operators. Digipads provide a numeric or alphanumeric set of keys that allows users to enter an access code to open the gates. Generally these will be mounted on near the gate so drivers can pull alongside to operate them. Multiple users can gain access to the property using a single code. Click here to see our range of Keypads/Digipads. A simple weatherproofed switch allowing anyone to open the gate via a push button. Most commonly mounted on apost or wall next to the gate. They can be linked to a timer switch so they operate during business hours and then disengage out of hours. Click here to see our range of Push Button controllers. Generally used inside the property to automatically open the gates when a vehicle is leaving. Loop detectors can be linked to 7-day timers to operate gates during business hours when a vehicle approaches and then disabled to keep the gate closed out of hours. Click here to see our range of Vehicle Loop Detectors. A timer device is ideal for business or communal locations with known hours of operation who want to limit access when the property is not in use. Timers can be linked to other access control systems such as push buttons or vehicle loop detectors so they only work during set hours. As well as controlling other access control systems they can be used in their own right to open gates during busy periods e.g. workplace or school etc. Click here to see our range of 7 Day Timers. Before deciding how you want to open the gates, you may wish to think about how you want to secure them and which gate type provides the best security. Sliding gates (especially metal ones) with correctly fitted hardware and locks are inherently more secure than swing gates. Although the gates could be forced open it would take significant effort to move the gate. Due to the simple physics of leverage double swing gates are less secure than sliding gates and are more susceptible to being forced open. There are gate motors that offer irreversible operation when closed which prevent the motors being forced inwards, but in reality this will only prevent casual and nuisance intruders. A determined intruder could still force the gate. Single swing gates offer improved resistance to being forced open as they can be locked against a post/pillar or wall on the latch end. To secure your gate further an electric lock can be added. Electric locks are simple to install and can be attached to almost all gates. The locking action is operated by a key but will remain locked if the power is cut by an intruder. They are more substaintial than conventional locks and will withstand some force. Click here for our range of Electirc Locks.